As seen in Sunset Magazine, Sweet Paul, Well + Good, Pacific Horticulture, Sacramento Street, and many more! "She is at the forefront of the “slow fashion” movement." 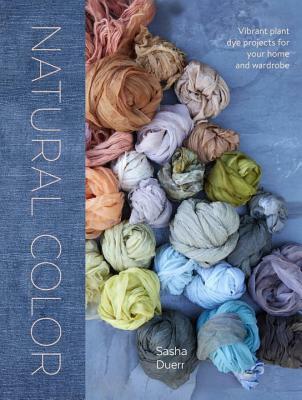 "A rich resource of indoor, plant-based DIYs"
"One of the prettiest books to land on our desks"
"Discover the wonderful world of natural dye." "Sasha Duerr’s book is all about the kind of awareness we need — not only for making better choices, but also for tuning into the cycle and offerings of nature. As Duerr points out, nature is the ultimate instructor, an invaluable source of color, inspiration and innovation for all creative endeavors." "Sasha makes a seemingly complicated process appear less daunting. Her beautifully illustrated book is filled with easy-to-follow recipes and ingredients that we all have on hand, in our gardens, or compost piles!" "In Natural Color, Sasha shares her extraordinary gift for seeing color in nature. Through accessible projects and seasonal plant dying recipes, Sasha brings beautiful color to our lives and deepens our connection with nature." "Duerr is knowledgeable and thorough, and fiber artists with an interest in incorporating natural dyeing into their work will find the information they need to get started, as well as insight into the dyeing process."